Enjoy the sound of life! Two Hearing Aids or One? 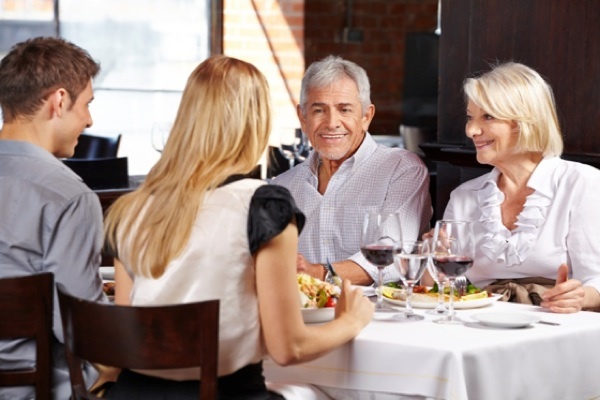 Noisy restaurants and environments with a lot of background noise can be a source of frustration for diners and socializers. This is especially true for those who are hard of hearing. Noisy venues and loud background noise can turn a night out on the town into a not so fun time for those who are experiencing hearing difficulty. As we approach the holiday season, people are excited to see their family members that are pouring in from out of town. Restaurants are filled with reservations for people who want to enjoy the chef’s holiday special, or even just enjoy a hot cup of coffee at a small café during the fall and winter weather. People with hearing loss shouldn’t miss out on this. We don’t believe hearing loss should cause frustration or make you miss out on life. Here are ten tips to help you enjoy your evening, and make sure you don’t end up in an unbearably noisy, social environment. When you are looking to make a reservation at a restaurant, take a moment and check online reviews on websites such as Yelp. Look for key words like bustling, lively, loud, or noisy. If it seems like the restaurant is a very loud place, maybe look into reserving elsewhere. This may sound silly, but go to the restaurants website and take a look at their photos. Bare walls and floors, concrete and lots of glass – this restaurant is likely to be very noisy just due to its design. Noise will bounce off bare walls and make it hard for anyone to hear comfortably! When choosing a restaurant, consider old-fashioned establishments with carpet, drapes and tablecloths. Such soft furnishings absorb sound and create a peaceful, intimate atmosphere. Simply call the restaurant and ask about their noise levels. Explain that background noise is a problem for you and they should give you an honest answer. When you are being seated in a cafe or restaurant, ask to not sit anywhere near speakers, open kitchens or coffee grinders. If the restaurant has an outside area that’s not on the street, ask to be seated there. Avoid dark restaurants. Even those with perfect hearing read lips and facial expressions to a certain extent. If there is a noise issue, do not hesitate to let the manager know. This may prompt them to turn down the music, or at least benefit other patrons in future. Try to pick cafes or restaurant that don’t feature a bar section where people tend to talk loudly. Last but not least, simply ask for a quiet table! There’s bound to be at least one. A number of possible solutions help decrease the problems of listening in a noisy environment. Try some of these tips and see how they work out. If you feel that you are in need of more help from a hearing care professional, do not hesitate to call our office at (714) 731-6549 and schedule a personalized appointment with one of our Audiologists. Please provide us with the information below to help us make your experience an exceptional one. Details help guide us in scheduling you the right appointment. How did you hear about us? How did you hear about us? Physician Referral Newspaper ad Family/Friend Direct Mail Yelp Google/Search Other...? Or call us at 714-731-6549 to schedule your personalized appointment today! Tustin Hearing Center has helped more than 20,000 hearing aid patients in the Orange County community, including Tustin, Santa Ana, Irvine, Orange, Anaheim, Garden Grove and many of the surrounding areas since 1989.